I have always been a fan of the styling on the 1964 300K. I still remember the first time I saw one in real life. It was in 1993. 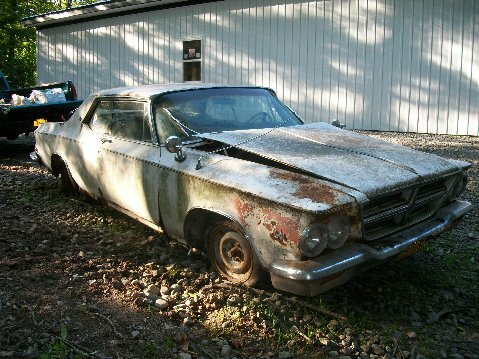 I was driving my 1963 Imperial to the meet in Chardon, putting along the New York thruway. In my rear view mirror I saw something rapidly approaching in the passing lane. It looked like it could be a K. It flew by like a rocket but then slowed and we were side by side. The K driver rolled down his window and shouted: “What year is it?” I replied: “1993”, somewhat concerned didn’t know what year it was. “No no, what year Imperial?” and that made a lot more sense. He roared off. I puttered along. I stopped for gas and there was the same K at the pumps. I went over to say hello and that is how I met Jerry Kocur. True story. The Ronk K, VIN 8443176451, was an Ebay purchase in January of 2013. I bought it from Charlie Rivera who lived in the town of Ronkonkoma on Long Island. I had a devil of time pronouncing that word so I shortened it and the car became the Ronk K.
This car has tinted glass, day night mirror, tilt wheel, manual windows and seat, tan vinyl interior, automatic, and one front seat head rest. The windshield registration is dated 1975 and old paperwork shows a previous owner of Gary Sulz, also from Long Island. There is a sticker from 1964 that says Town of Brookhaven, NY beach parking. Brookhaven is on Long Island. I vacuumed inside and found sand in lots of places. Yessir, looks like this has always been a Long Island car. Now let me tell you about Mr. Sad. This was a white 4 speed coupe, VIN # 8443182731. 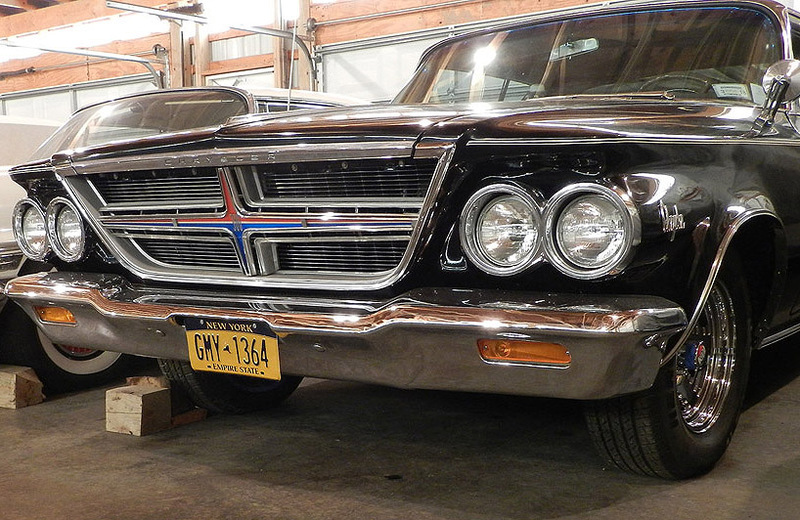 You may know that 1964 was the first year Chrysler offered their A833 transmission. There were 82 4 speed Ks built. 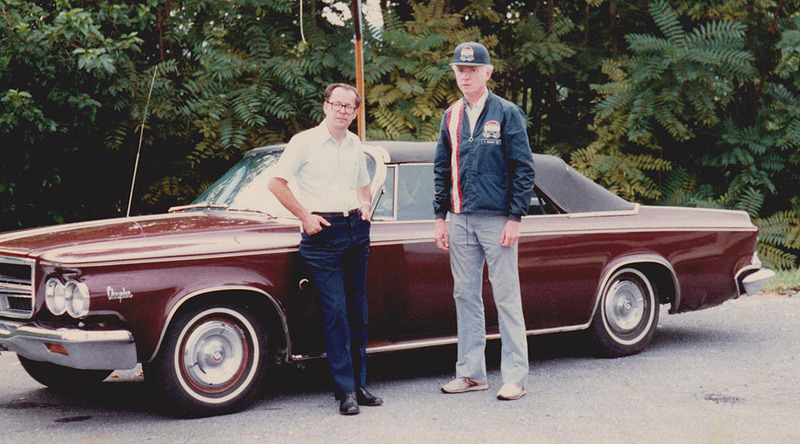 This was a one owner car but he parked it outdoors in 1975 and he let it sit. It took his death to get the car sold. When the car arrived at Golden Lion Grrrages in 2011, it didn’t have a name; it was just that white coupe but when I saw the rust, the broken hood hinges, the rot, and the decay, it had a name; Mr. Sad. There was no saving this car, yet I thought a rare 4 speed should be saved. So I decided to take the 4 speed parts from Mr. Sad and transfer them to the Ronk K. Mr. Sad was junked. On the Ronk K, I had never done a transmission conversion of this kind and the learning curve is steep the first time around. One of the first odd things I encountered; in 1964, tilt wheel cars could not have the manual transmission. It turns out the turn signal switch on tilt wheel cars was in the same area as the clutch pedal so you couldn’t have both. (Chrysler moved the location of the switch in 1965 so you could have tilt wheel with the manual). The Ronk K had a tilt wheel so the tilt had to come out. 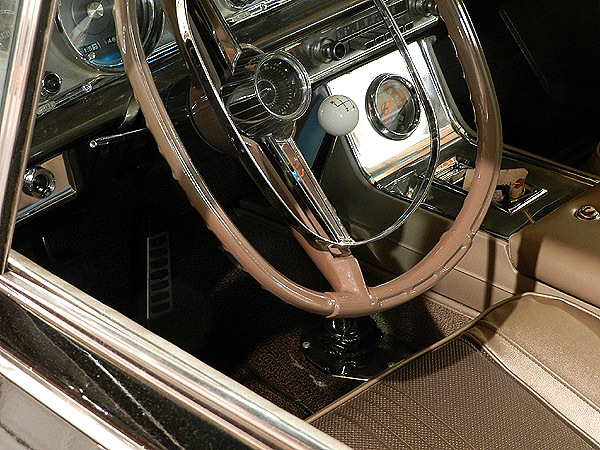 Then the center console had to come out because in 1964, manual shift cars used the 1963 console. The conversion took some time and it is pretty well documented at http://www.simplexco.com/auto/1964/1964k.html should you be interested in the details. With the mechanical work completed, the Ronk K went off to Johnny Slayton’s for body work. It came back in 2017 with new paint and a new interior. This year has allowed only a few short drives around the neighborhood but things are working out well and I look forward to learning more about the Ronk K.